Over the Family Day Long Weekend, February 18th & 19th, the Ukrainian Sports Federation of US and Canada (USCAK) hosted the 2nd Annual Alexander Cup International Ukrainian Hockey Tournament in Toronto, Ontario, Canada. Tournament participants included two Toronto teams, KONTAKT and the Toronto Kozaks, the Montreal Ukie Club from Quebec, the Edmonton U.A. Lions from Alberta and the New Jersey Kings from New Jersey, USA. On Saturday, February 18th the tournament held five round robin games where teams picked MVPs from the opposing team. MVP medals were awarded during the reception Saturday evening at Baby Point Lounge, where festivities lasted into the wee hours of the morning. MVP recipients were especially honoured as they felt their selection by competitors from peers of their opposition was the most prestigious form of recognition. Sunday morning February 19th at 10:30 a.m. saw the battle between the Toronto Kozaks and the New Jersey Kings for the right to move onto the semifinals. New Jersey drew blood first but Toronto rallied with six straight goals. New Jersey fought back in the 3rd period with two more goals but had to settle for fifth place with a 6-3 loss to the Toronto Kozaks. In the first semifinal, Edmonton Lions easily handled Montreal Ukie Club with a 5-1 win advancing to the gold medal game. In the second semifinal, KONTAKT also easily handled Toronto Kozaks with a 6-2 win advancing to the gold medal game. The bronze medal game appeared to be a forgone conclusion as the tired Toronto Kozaks entered the rink to play a back to back game after losing to KONTAKT. A fresh Montreal team scored first but Toronto responded to end the first period 1-1. In the second period Montreal scored two unanswered goals entering the 3rd period with a 3-1 lead. Midway through the 3rd period, Toronto made it interesting, closing the gap with a goal making it 3-2. With less than 2 minutes left in the 3rd period, Toronto scored two goals to take a 4-3 lead, to the dismay of the Montreal team and stunning fans in the stands. But Montreal was not done yet. With 24 seconds left in the 3rd period, Jeff Debelle scored an unassisted goal to tie the game and forcing an overtime period. The arena was silent as everyone tried to catch their breath and figure out what just happened during the last two minutes of play in the 3rd period. At the 2:24 mark of the “sudden death” overtime, a scramble erupts in front of the Montreal net and Lucas Bender of Toronto scored the game winner. The Toronto Kozaks shocked everyone earning the tournament’s bronze, 3rd place, position. The gold medal game had the makings of a game 7 of a Stanley Cup Final. Edmonton was laser focused to taking the Alexander Cup back home with them to Alberta. KONTAKT exhumed confidence after defeating Edmonton 5-0 in round robin play the day before. Both teams dominated the tournament during round-robin play and this game was “for all the marbles”. The fans were treated to some of the finest amateur hockey at a junior “A” level. The game was fast paced and gritty. No team was prepared to give an inch. Just as the fans were treated to an exciting finish in the bronze medal game, the gold medal game proved to be just as exciting. KONTAKT attacked first, but laser-focused Edmonton came back to hold the lead. With 1:03 left to play in the 3rd period, KONTAKT was down 6-3. Within 24 seconds, KONTAKT scored two unanswered goals making the score 6-5. With only 27 seconds left on the clock KONTAKT pulled their goalie rallying six KONTAKT attackers against Edmonton’s wall of defense. Edmonton held off KONTAKT’s relentless attack for the remaining 27 seconds, which felt like a 27 hour battle to win the Alexander Cup 6-5. With the 2nd Annual Alexander Cup in the books, all visiting teams have thrown in their hat to host the 3rd Annual Tournament. Edmonton has committed to send two teams to the next tournament and ice three teams should Edmonton get the nod to host the tournament. 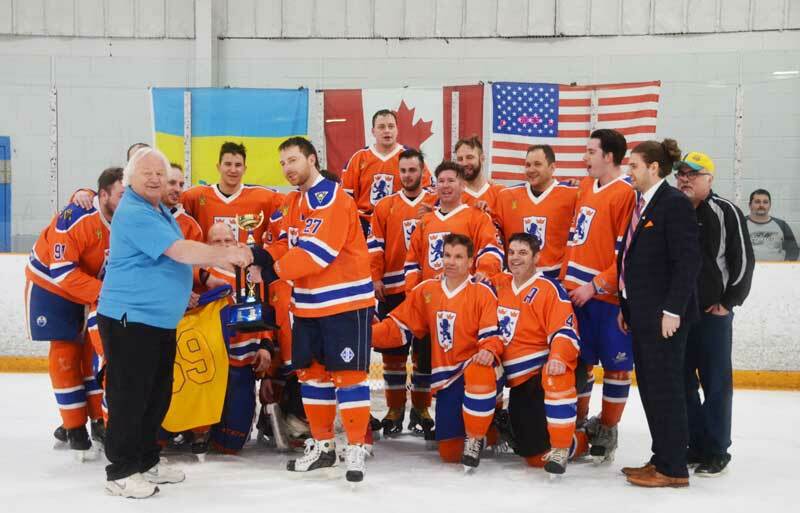 With potential teams from Detroit, Chicago, Cleveland, Winnipeg and Calgary, the Alexander Cup has given rise to an exciting revival of Ukrainian Hockey in North America. A special thanks goes to Myron Bytz, President of USCAK, for the foresight in initiating the Alexander Cup in 2016 as part of the Ukrainian Hockey Weekend at the Prudential Centre. This event included the NHL New Jersey Devils’ Ukrainian Heritage Day, showcasing Ukrainian culture and heritage before the New Jersey Devils took to the ice for a regular NHL season game against the Los Angeles Kings.